Definition - What does Oocyte mean? An oocyte is an immature egg that develops from within a follicle inside in the ovaries. It is the female germ cell involved in reproduction that needs to mature before fertilization can occur. 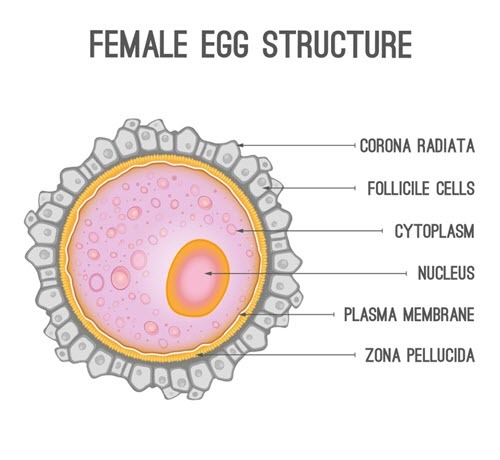 After becoming a secondary follicle and then Graafian follicle, an egg or ovum is released through the process of ovulation. Normally one follicle will become a mature egg with each menstrual cycle. At birth, a woman has all the oocytes that she will have for life. This number drops with age and after each normal menstrual cycle. An oocyte is also known as an egg or egg cell. An oocyte will mature during the first week of the menstrual cycle. Up to two days before ovulation, the oocyte will be nourished by the surrounding cells. As this process happens, the surrounding cells start to proliferate and produce a high progesterone concentration. Then the follicle will release a fluid along with the oocyte to allow for a smooth flow of the mature egg to the fallopian tubes, where fertilization may take place. Follicle growth can be followed by conducting an ultrasound.